Can I Give My Ferret Amoxicillin? | Can i Give My Ferret? Can I Give My Ferret Amoxicillin? Can you give your ferret Amoxicillin? Ferrets make wonderful pets because they are very active, fun-loving, affectionate and just full of crazy antics. They never fail to rub off its happy disposition to anyone in the room with them. Their continuous bouncing and running around are just simply endearing. Even when they get extremely boisterous and display their usual antics of taking and hiding things they see and chewing on stuffs, still they remain charming. A ferret owner will agree that it never fail to chase the blues away. It’s hard not to fall in love with a ferret. You see one and you instantly want to take it home with you. When you are used to seeing the very agile ferret suddenly looking weak, getting slow and not eating, you get really worried. And this is for a good reason considering how very fragile and delicate they are. Because pets like ferret immediately becomes like family, it is difficult to see it suffer. Yes, but under veterinarian supervision. One of the more important things that a ferret owner should first know when deciding to get a ferret as a pet is to know what possible illness may befall on them. Proper education is the key so you won’t easily panic and you know what to do when you see some early symptoms of some possible sickness. There will be some diseases that the ferrets may be more susceptible to than others. As a ferret owner, you will need to know these essential details about your ferret, so you can help it when it needs you the most. Aside from seeing them suddenly weak and not as active, take the temperature of your ferret. It should be between 101 and 102 degrees to be normal. If it’s higher and you can feel them hot to touch, be wary. Take him to a veterinarian as soon as you can. If there is any reason you cannot take him to see a veterinarian as soon as possible, do not self-medicate with some over-the-counter medicines. For one, you are not yet sure what is wrong with the ferret and giving the right dosage is very important. It might do the ferret more bad than good if you insist on self-medicating. Amoxicillin is one drug that is most abused. Maybe because it is widely available and can be found in any first aid kid easily. Since there is no medication made specifically for ferret, amoxicillin formulation for human can be given to ferret but only when prescribed by a veterinarian. 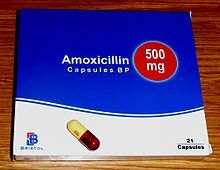 Amoxicillin is an anti-bacterial and anti-inflammatory drug used to cure infections most notably respiratory and gastric infections. Extra precaution is needed when taking this medication as it may have some side effects like upset stomach, nausea, hypoglycemia and convulsion. There can be a lot of reason why I ferret will not feel well. You should be aware of what the ferret has been taking and eating and what it has been exposed to for the veterinarian to easily find out what is wrong with it. Ferrets are very sensitive pets. They are susceptible to common cold and flu. They are touted to be one of the few animals that can catch a common cold and flu just like the humans do. Like human beings they will exhibit same symptoms of common cold like sneezing, running nose, fatigue and loss of appetite. And like human’s common cold, a ferret’s common cold will also go away with its own with proper hydration and lots of rest. And if you go to the veterinarian, he may also prescribe antibiotics like amoxicillin to your ferret for this. Because they are usually chewing on things, sometime swallowing anything in sight and improperly fed, they are easily prone to indigestion and diarrhea. Some cases it’s coupled with vomiting and fever. More serious disease like gastric ulcer may get to your ferret as well. This can sometimes lead to fatality as it shows very few symptoms even during blood tests. That is why it is very important to be very careful what to feed a ferret. Gastric ulcers are caused by some bacteria in the stomach and indications are dark stools, grinding of teeth and loss of appetite. It is important to see a veterinarian immediately when you see some unusual symptoms from your ferret. Trust only the expert on your ferret’s health and well-being. Sometimes, quick thinking and action can spell a lot of difference in making sure your pet is well and safe and for your peace of mind too. I pray for a speedy recovery of your loved one.